By Anthony BreznicanWhile there has been wild speculation about where Depp took his visual cues (including a theory he was mimicking Marilyn Manson), Depp tells EW about how he actually developed the look, and we reveal the image that inspired him. Well, not really … Separate sections of the individual? The title of Sattler’s original work is “I Am Crow,” and although there are Crow peoples native to the northern part of the American Midwest, Sattler says his paintings are not meant to refer to specific tribes. In the new film, Tonto is technically a full-blooded Comanche, and Depp identifies in real life as part Cherokee and Creek Indian, based on a Kentucky great-grandmother’s ancestry, so the character is proving to be less historically specific to one tribe than a blend of various cultures and influences. ‎"Johnny Depp reveals origins of Tonto makeup"--he fabricated it from a painting with no basis in historical reality. I'm glad to see that all of us who guessed Depp's source and motivation were basically right. He "honors" and "respects" Indians by inventing one out of thin air. Just like a million hipsters, New Agers, and other wannabes.What else could he do? He's playing an invented Indian.He could've researched the Comanche of Texas and made Tonto look like one of them. Tonto is an invented member of a real tribe and a real race, not some sci-fi creature from another planet. When Hollywood starts inventing looks for gold prospectors and Cavalry soldiers--some of Tonto's contemporaries--then it can invent Tonto's look too. Heck, let's put a crow on everyone's head: the Lone Ranger, the schoolmarm, the saloon-keeper, et al. What's the justification for singling out the Indian for this treatment? In short, "Hollywood invents things" is no excuse whatsoever. Hollywood invents things based on racist stereotypes that apply to minorities but not to whites. That's the problem we're noting here. It's the same reason cartoon Indian mascots are wrong but cartoon cowboy or pirate mascots are okay. One discriminates on the basis of race and is thus racist; the other doesn't.Tonto was Comanche?I think he was unspecified in the original, made Apache in one or two versions, and is considered Comanche this time. The setting is Texas in the mid-19th century--the Lone Ranger is a former Texas Ranger--so the primary choices are Comanche or Apache. You'd have to stretch to imagine a Tlingit, Cree, or Mohawk Indian in that time and place. Note what sounds like a disconnect between Depp and Sattler. Depp thinks the crow is flying behind the Indian's head. Sattler talks about the "headdress"--but the only thing resembling a headdress is the crow. Ergo, the crow must be on the Indian's head, not behind it. So Depp not only falsified a Comanche look from a Crow painting, he falsified what was in the painting itself. He decided his fairy-tale dream of an Indian--like his fairy-tale dream of a pirate--was more important than anything. "I saw a crow flying in a painting and thought it belonged on Tonto's head." An Indian with a spirit animal on his head...why not? Apparently Depp thinks all Indians are touchy-feely mystics who talk to animals, commune with the dead, and so forth. They're supernatural beings, like warlocks, elves, or fairies, not real people. Let's also note that we can dismiss the Depp defenders who said he wouldn't stereotype Indians, he has no control over the costume, etc. You were all very, very wrong. As I thought, Depp's understanding of Indians is superficial and stereotypical. 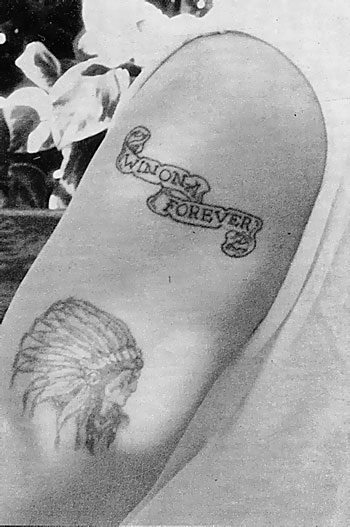 If you saw his "Cherokee" tattoo of a Plains chief in a headdress, you might've guessed this. Depp's motivation is the same as those who dress up as Indians for Halloween or beer parties: "I wanna look like my fantasy of an Indian." How a Hollywood star thinks: "I saw a funny-looking Indian somewhere. I'll use that look in my big-budget movie and cement it in people's minds worldwide." This is why you cast Natives, not wannabes, to play Natives. Even if Depp does everything right in the movie, his "spirit animal" costume and character will influence millions of opinions. A non-Native is determining what many people will think about Indians for years to come. Sure, a Native actor might've made the same choices...but it isn't likely. A Native actor probably wouldn't have the same sense of white entitlement. He wouldn't have thought, "My vision of Native life is better than reality. I'm a star so I know best." For more on Johnny Depp and his costume choices, see Tonto as a "Spirit Warrior" and Johnny Depp in a Crow Headdress. For more on the issue of his playing Tonto, see Open Letter to Johnny Depp's Tonto and Why Tonto Matters. Awful, so annoyed and saddened by this and agree with you completely.